WASHINGTON—Admonishing everyone who knows, works with, or is related to a man to consider the feelings of men for whom the Kavanaugh hearing may have dredged up painful denial-related memories, experts urged the U.S. populace Monday to be extra sensitive to those men who are currently being forced to relive the trauma of wanting a thing but not automatically getting that thing. “It’s certainly not easy to watch Brett Kavanaugh live out this nightmare on the national stage, and our hearts go out to all men who have ever experienced something similar—if you know a man who has ever been denied something or who even feels as if they have been denied something, be sure to make time to check in with them and let them know that you support them,” said specialist Robert Kusinski of the Harvard Center for Masculine Trauma, explaining the importance of excessive empathy in understanding the overarching isolation, shame, and anger felt by adult males who have never even briefly been denied something they wanted upon hearing any version of the word “no.” “Please make sure that you’re mindful of your tone and be kind. Trump-era men have been asked, sometimes even more than once, to relive the traumatic experience of not automatically getting something they desire. The shock of this new experience, on top of not being given something they want, takes an enormous toll on a man. 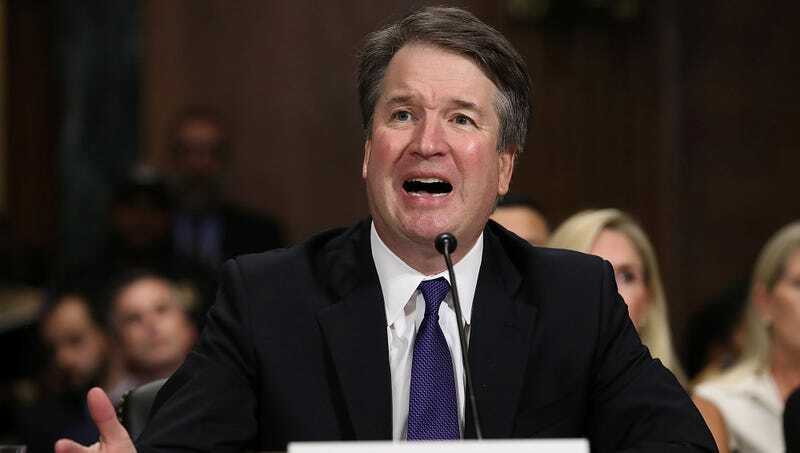 Even the 93 percent of men who eventually do in fact receive the thing they wanted often find themselves experiencing latent feelings of rejection and humiliation, memories of which can return in full force if triggered by high-visibility public events such as poor Mr. Kavanaugh’s ordeal. It’s crucial for non-men to remember that men are grieving right now, and they need you to be there for them.” Kusinski further stressed that, when comforting a man who has experienced this trauma, one should also make sure to apologize sincerely and profusely for any role they may have played in the victim previously not receiving something they wanted.